Solar-electric panels (photovoltaic—PV—modules) are devices that convert sunlight energy into electricity. You’ve likely heard a number of terms to describe different types of PV modules, but how do you know which one to choose and what are the differences between them? The technologies used to manufacture solar-electric (PV) cells (the building blocks of solar panels or modules) and the differences among the final products are described below. To manufacture single-crystal (also called monocrystalline) cells, the purified silicon is first melted, then a crystal is grown by placing a “seed” crystal into the molten material and drawing it slowly up from the heated crucible. The seed sets the pattern for the growing crystal, resulting in a large, cylindrical crystal called a boule. The boule must be sawn into very thin wafers which are the basis of PV cells. Call or email our trained technical sales staff members to request a free sales quote for a solar electric system that will meet your needs. Monocrystalline silicon is the most efficient at converting solar energy to electricity because the cells’ molecular structure is arranged very uniformly, allowing for the most ideal transfer of electrons through the material with the fewest interruptions. Cell efficiencies for commercially available monocrystalline PV modules currently reach about 17%, with module efficiencies generally being a bit lower. Multi-crystalline (also called polycrystalline) silicon modules are slightly less efficient (12-15%), but are less expensive to produce. The manufacturing process for polycrystalline cells involves casting of molten silicon into molds where the material hardens into “ingots”. The resulting solid mass includes multiple intersecting crystal lattices and gives these cells their characteristic “jack frost” appearance. Polycrystalline modules have varying grades based on the size of the crystals and the number of impurities, both of which are largely determined by the cooling rate of the material. Larger crystalline wafers are more expensive to produce, but are more efficient because of their tighter molecular structure. Physically and electrically similar to polycrystalline is the “string ribbon” technology, currently used exclusively in the production of modules from Evergreen Solar. In this process, the melted silicon is formed into thin sheets by drawing it up from a vat of molten silicon in a ribbon-like film suspended between two wires or strings—think of a child's bubble-blowing wand or ring and you won't be far from the mark. The key advantages to this process are that the resulting cells need not be sliced from a solid mass—they are simply laser-cut from the continuous ribbon—like using a scissors—so there’s less waste; and the cells are thinner, therefore less silicon is used. 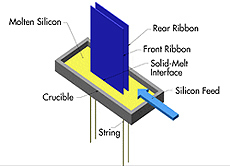 String ribbon-based modules are slightly less efficient (10-14%) but cost less to manufacture than traditional crystalline types. Unlike their crystalline cousins, thin-film PV modules have no crystal structure— the silicon atoms are arranged at random, much like in glass. Instead of growing and slicing crystalline materials, thin-film modules are created by depositing very thin layers of photo-reactive materials onto a substrate, such as stainless steel. Thin-film’s typically low efficiencies (8-12%) are often countered by its unique advantages. It does better than crystalline in high-temperature areas (roughly above 30°C. typical ambient temperature). Its shade tolerance is in part due to the fact of its normally non-cellular construction. While mono- or polycrystalline panels are comprised of series-wired cells, where each is dependent on its neighbor to help reach the total rated voltage of the module, thin-film types are not so limited. Partial shading of crystalline PV modules—due to a tree branch or a leaf blown onto the module surface—can result in near-zero current output, while thin-film modules’ output tends to be reduced more or less in step with the amount of surface area shaded. The lack of brittle crystals and the use of alternative encapsulation techniques (i.e., no glass covering) allow thin-film modules to be made in various lightweight, flexible shapes. 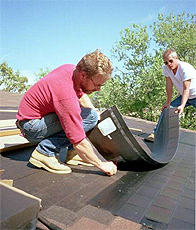 Thin-film has been used to make roll-out laminate modules for metal roofs; lightweight, foldable modules for military and portable needs; and even PV roofing shingles. It is very adaptable for use in consumer electronics with lower power requirements like watches, calculators, yard lights, and for charging computers, cell phones, MP3 players, and other equipment for on-the-go lifestyles. Building-integrated photovoltaic (BIPV) solutions, that blend into the architecture better than standard framed modules, are another developing use for PV and thin-film will play a big role there. Even clothing with integrated thin-film PV has made its market debut! The big promise of thin-film technologies is not only lighter weight but lower production costs, which should ultimately overcome the technology's big drawback: low power density, as measured in Watts generated per square unit of surface area. Crystalline module types can have up to three or more times the power density of some thin-film types. If the available surface area for mounting PV modules is limited—as might be the case in a roof-mounted solar array—then thin-film modules may not have the power density to produce all the power you need in the space you have. Another quirk of thin-film PV is the “settling-in period”. The materials used in their manufacture are initially less stable than mono- and polycrystalline cells. When first exposed to sunlight, their output decreases rapidly over a short period of time (typically weeks) by as much as 20% before they finally stabilize. That means some thin-film modules will produce well above their rated output during the first few weeks of full-time operation. If you're using new thin-film modules you may think you got a real bargain! But after settling in, such modules’ output will typically fall into line closer to their rated output. Currently, two types of thin-film PV products are on the market—amorphous silicon (abbreviated a-Si) and Copper Indium Gallium diSelenide (CIGS), which uses no silicon at all. The advantage to CIGS technology is higher absorptivity than amorphous silicon, with 99% of the light shining on the panel being used for energy production. The addition of gallium to the copper indium diselenide semiconductor material widens the spectrum of solar radiation that can be absorbed, improving overall efficiency of the panels. In addition to being more efficient than a-Si, these panels are more environmentally friendly in their manufacturing process. They also do not suffer degradation in cell efficiency associated with other thin-film PV products. So, how do you go about choosing which modules to buy? Price isn’t the only factor to consider. A lot depends on where you live and the environment where the modules will be placed in service. Almost all solar modules are designed and built for outdoor use, so the durability factor is often covered. Most modules are framed in metal and covered in tempered glass. Hail impact ratings for up to 1" stones at 50 MPH are common. Some of the amorphous panels (like those from Unisolar) use a UV-resistant polycarbonate covering, which avoids the possibility of shattered glass while still offering excellent weather-proofing. How large an array do you want to put in and how much room do you have on your roof or other location? If space is at a premium, then consider mono- or poly-crystalline modules. Modules are not uniformly shaped, so the dimensions of one model over another may make better use of your available space. Carefully measure the proposed installation space (avoid rooftop vent stacks or chimneys—even small shadows can dramatically drop your solar array output!) and then see what configurations work best. However, if you simply need to get the most energy for your buck and space is not an issue, then you might consider amorphous panels. Aesthetics is often a major factor in homeowners’ purchase decisions, especially for solar modules that will be placed in plain view, on the ground, or on a visible roof pitch. Monocrystalline and amorphous panels tend to have darker colors while multi-crystalline panels often have an iridescent blue color. But technology is the not the only determinant of color; one amorphous type has a deep maroon color! Not only color but module shape contributes to appearance. Some module manufacturers are coming up with solutions to fit more modules onto rooftops and with more aesthetically pleasing profiles—from solar shingles to triangular shapes to fit in corners so that the entire area of a roof can be used. Another major consideration is availability. Module manufacturers change their product lines to keep up with market demands and technology refinements, so what’s available today may not be available two years, one year, or even six months hence. If you’re planning to expand your solar array in the future, you run the risk that the modules you install today will not be available when you’re ready to expand. Further factors to consider: What sorts of environmental safeguards and improvements are being made to the manufacturer’s process? How much embodied energy is represented in a given module and therefore how long must the module operate to “pay for itself” in terms of the energy used to make it? Don’t forget to consider the length of the warranty, the weight of the modules to be lifted onto the roof, where the modules are manufactured, and shipping costs. Clearly, there are many subtle, as well as not-so-subtle, differences among solar panel technologies. Understanding the differences—at least in the broad strokes offered here—can assist you in selecting the best panel type for your situation. Factors affecting your selection include price and availability, electrical characteristics, installation location dimensions and temperatures, and aesthetics. While it may seem a daunting task to make a selection among the many types and models available, it often happens that one or more of the factors above, as it will tend to lead you toward a likely candidate. And, of course, we're here to assist you with our expertise as you move toward installation of your own solar electric system.